Piedmont Founder, Chairman and CEO Roland Johnson is flanked by executives Michael Kelly, left, and Eric Barnett, right. Kelly is chair of the Biotech Center’s Advisory Committee for Biotechnology in the Piedmont Triad. As CEO Roland Johnson gives a tour of his twin companies, Piedmont Animal Health and Piedmont Pharmaceuticals, in Greensboro, he opens a laboratory cabinet and points with unabashed pride to a white KitchenAid mixer. Using that simple household appliance and some clever chemistry, his company’s scientists invented soft, chewy cubes that can be stably infused with active pharmaceutical ingredients. To pets, the chunks are delicious treats, as Johnson demonstrates in a video showing his own dogs gobbling up placebo morsels. To veterinarians and pet owners, the chewables are a welcomed alternative to pushing pills down animals’ throats. The meat-free chewables are made without water, heat or an extrusion process, so active ingredients are protected. They can be used to administer a variety of medications to dogs or cats hassle free. Piedmont sold the drug-delivery platform to Bayer HealthCare Animal Health, which uses it in two products for dogs: Advantus, an oral flea medicine, and Quellin, a pain reliever and anti-inflammatory. The chewables partnership with Bayer has been Piedmont’s biggest product success to date. “When I started Piedmont 17 years ago . . . I never could have imagined that within 10 years from that point we could be such an important development company with a partner like Bayer,” Johnson recalls. In the wake of the Bayer partnership, Piedmont did not become a one-hit wonder. It has successfully launched or out-licensed several other products and technologies, and its core pipeline is packed with 20 more products. A dozen of them are expected to enter regulatory review within the next five years. Among the innovative pharmaceutical products in development are pain relievers and antibiotics for cats and dogs and a potential treatment for feline kidney disease. These products would address large markets that Piedmont says present opportunities for improved solutions. “We always go for areas where we can have a big impact,” says Eric Barnett, M.D., the company’s executive vice president. The $13 billion global market for companion-animal health is dominated by a handful of multinational companies. Small companies that develop animal pharmaceuticals comprise only a tiny portion of the industry, unlike the human-health industry, which is jammed with hundreds of pharmaceutical startups. Though tiny compared to its competitors, Piedmont is feisty and willing to take on the corporate giants. Pirate flags hang on its office walls as a constant reminder for the company’s employees to be scrappy and opportunistic. Kelly produces a list of the world’s top-10 animal health companies, all multi-national behemoths. “That’s who we compete against,” he says. Because of recent industry consolidation and steep regulatory hurdles, only five or six new veterinary drugs are typically approved for sale each year, providing Piedmont with ample opportunities for new product development. “There is a massive gap in innovation in new drugs in this field,” Johnson says. Piedmont’s strategy for filling that void is to be fast to the market with innovative products that are mostly conceived in its own lab, versus acquiring or in-licensing from other companies. The numbers back him up. Piedmont has 46 patents issued and 70 patents pending globally, and its annual investment in product R&D is about $10 million. “For animal health, that’s a lot,” Johnson says. Piedmont’s R&D spending is bankrolled by revenues from several successful products in both animal and human health. A product poster for Claro hangs on a conference-room wall. Piedmont developed the anti-infective medicine for canine ear infections and sold it to Bayer. In addition to its chewables technology, on the animal side Piedmont invented an anti-infective drug to treat otitis externa, a canine ear infection that is the second most common reason dog owners take their pet to a veterinarian. “That product makes the vet look like a hero,” Johnson says. A single dose of the eardrop is given one time in the clinic, sparing dog owners multiple trips to the veterinarian’s office or the repetitious chore of applying medicines at home. 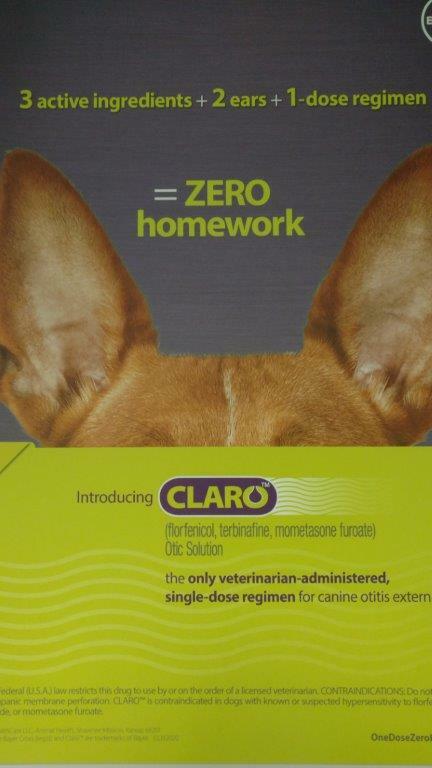 Piedmont sold the drug to Bayer, which markets it as Claro, the first single-dose treatment for otitis externa. Another Piedmont invention sold to Bayer is a tick spray for dogs and cats marketed as Resultix. Piedmont has developed several other products for horses and farm animals. Among them is a preventative for barn and house flies. The active ingredient, delivered in alfalfa-based pellets mixed with horse feed, is excreted in manure, where it kills fly larvae. Piedmont licensed the product to Pfizer Animal Health, now known as Zoetis, the world’s largest animal health company. Zoetis markets it as Solitude. Zoetis has an unrelated poultry business in Durham, formerly Embrex. 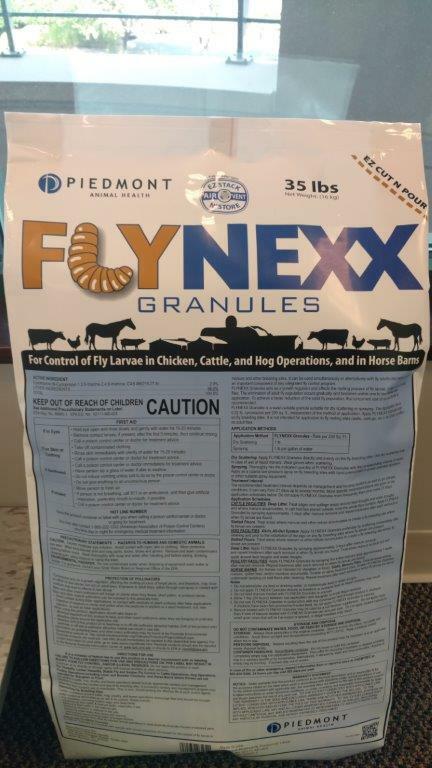 Piedmont developed a fly-control product for use in the swine, poultry and cattle industries under its own Flynexx brand. Flynexx granules can be spread on animal manure or mixed with water and sprayed on the waste to kill fly larvae. A bag of Flynexx granules is displayed in Piedmont’s lobby. The product controls flies in swine, cattle and poultry operations. Piedmont Pharmaceuticals leveraged its expertise in parasitology to develop a safe, pesticide-free treatment for head lice in children and adults. The product, sold under the brand name Resultz and other names, is sold in 11 countries and was recently cleared by the Food and Drug Administration for sale in the United States. The patented product is a kit containing an odorless liquid and a comb. With one five-minute application – the shortest for any lice product on the market – the solution kills and eliminates the tiny blood-sucking insects and their eggs. “It’s been a great success internationally,” says Barnett, who notes that in his native United Kingdom the product has all but replaced traditional head lice treatments that contain chemical insecticides. About 10 million kits have been sold globally during the last decade. Resultz contains ingredients found in many cosmetics. It works not through chemical action but by physically dissolving the wax coating on lice, causing dehydration and death. The solution also kills so-called “super lice” that have become genetically resistant to pesticide treatments. Piedmont expects Resultz to catch on quickly in the $250 million U.S. market for head lice, especially as word of its pesticide-free mode of action spreads among parents, teachers, school nurses and pharmacists via social media. It is looking for a strategic partner to launch the kit. All of the diverse products conceived and launched by Piedmont share a common thread: Johnson’s uncanny understanding of market needs and how to meet them, his colleagues say. For Johnson, it’s a simple matter of making it easier for pet owners and veterinarians to care for animals. 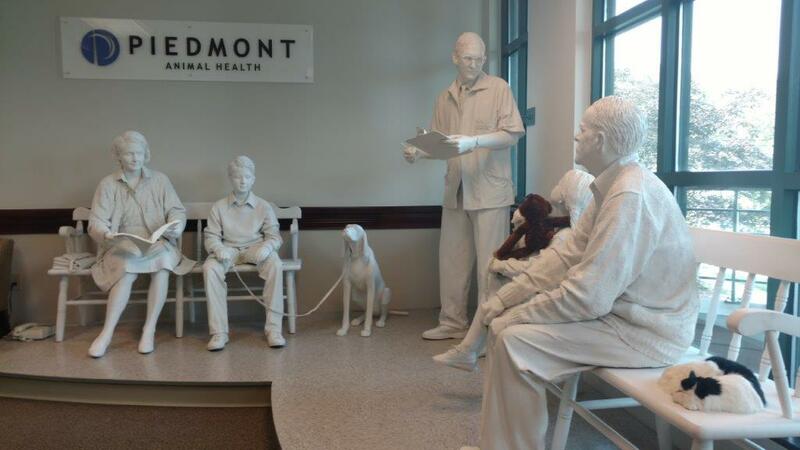 Piedmont’s lobby features a plaster-cast tableau of a veterinary waiting room. The sculpture was commissioned by Ciba-Geigy Animal Health as a trade show exhibit to promote Interceptor, a heartworm preventative for cats and dogs. The exhibit was given to Piedmont in 2016 by Elanco, Ciba-Geigy’s successor, to honor the role that Piedmont employees played in the development of Interceptor when they worked for Ciba-Geigy. Johnson also keeps in mind that “our number one customer in this country is the FDA” and its Center for Veterinary Medicine, which regulates animal drugs for safety and efficacy. “We guard that relationship,” he says. Piedmont invests major resources to push products through clinical trials and regulatory review as efficiently as possible. “If we don’t get products approved, we don’t have a company,” says Barnett. The FDA focus has paid off. “Eighty-five percent of the veterinary products we’ve started in our careers have actually been approved by the FDA and entered the market, which is a big number,” Johnson says. Johnson credits Piedmont’s success to the board of directors and his team of scientists, executives and staff, many of whom joined Piedmont after long careers at major bioscience companies in the region and have stayed with Piedmont through lean times. 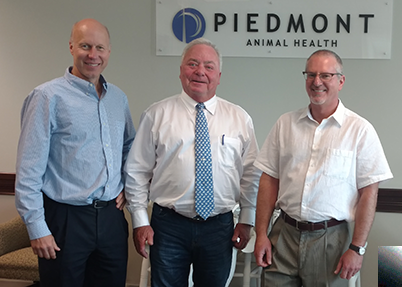 Collectively, the five members of Piedmont’s management team have about 150 years of industry experience. At various companies they have been involved in developing and marketing more than 15 best-selling products for dogs, cats and horses. As recently as 2012 the team had played roles in commercializing over 10 percent of all FDA-approved products in the companion animal market, Kelly says. Business lessons learned from that experience are applied to Piedmont’s operations. The company tries to limit its bureaucracy, encourage employee retention, manage multiple projects in parallel, focus on promising products and quickly terminate unsuccessful projects. “We really are very efficient at making decisions,” Kelly says. Johnson credits North Carolina’s bioscience ecosystem of universities, companies and service providers for contributing to Piedmont’s success. The company has project collaborations with academic and company partners throughout the state and also has benefited from the programs and services of the North Carolina Biotechnology Center. In 2003, when Piedmont was in start-up mode and financing was tight, the Biotech Center provided a $150,000 loan. “That loan was critical at the time for our company,” Johnson recalls. The funding helped Piedmont develop its head lice treatment, which generated the company’s first product revenues. Piedmont went on to raise $9.5 million in financing from angel investors and an Australian venture capital company, CM Capital (now known as Talu Ventures), about 10 years ago. Piedmont repaid the Biotech Center loan – with interest, Johnson notes – and has been self-funded ever since. Piedmont’s employment has tripled during that time, from eight full-time employees to 24 today. The staff occupies an entire floor of a leased office building that provides them with 11,000 square feet of pet-friendly offices, a conference room and labs. Another 100 or so contract employees help Piedmont with product development and manufacturing. Many of them work at two North Carolina-based contract development and manufacturing companies: Alcami in Wilmington and Ei, A Pharmaceutical SolutionWorks in Kannapolis. Piedmont is not Johnson’s first entrepreneurial rodeo in animal health. In 1996 he founded Blue Ridge Pharmaceuticals in Greensboro to develop animal health products. In only two years, the company started 13 development projects, catching the eye of Idexx Laboratories, a global pet health care company based in Maine. Idexx bought Blue Ridge in 1998 and went on to commercialize 11 of its 13 products, Johnson notes with pride. Prior to starting Blue Ridge, Johnson had a long career at Ciba-Geigy, which later became Novartis and was most recently acquired by Elanco. He and a small team grew Ciba-Geigy’s new animal health business in Greensboro from zero to $300 million in annual revenues by developing products including the blockbuster anti-parasitic medicines Program, Interceptor and Sentinel for cats and dogs. Johnson’s entrepreneurial success has earned him and his company several awards, including the Award for Entrepreneurial Excellence in 2005 and 2008 from the Biotech Center’s Advisory Committee for Biotechnology in the Piedmont Triad.